After a career spanning nearly a half-century, Jerry Reed has gone and left his guitar on August 31, 2008 after suffering emphysema. He was a great, colourful personality and sometimes people didn't even notice that he was just about one of the best guitarists you could ever hear. Self taught but heavily influenced by the Mulhenberg (Ky) fingers and thumb picking style developed by Mose Rager, Ike Everly, Merle Travis and Chet Atkins, his guitar work is was just stunning. He made many innovative albums for RCA Victor between 1965 and 1976. He was used on recording sessions of Elvis Presley, Waylon Jennings or Bobby Bare and had written songs for Elvis, Johnny Cash, Porter Wagoner, Brenda Lee and many others. That Georgia born cat deserves really the tag of "Mister Whiz", a song he recorded for Capitol, in January 1956. Born in Atlanta, Georgia, on March 20, 1937, his parents divorced in his first year. From there, and until 1944, he lived with his sister in orphanages and foster homes. He rejoined his mother in 1944 and started to listen the Grand Ole Opry often playing rhythm on a hairbrush. Around 1946, his mother bought him a second hand guitar for seven dollars and taught him his first chords. But, from the start, he was determined to play music his own way. He dropped music lessons and fall in love with Merle Travis guitar style and Earl Scruggs banjo claw hammer style. By the time he entered O'Keefe High School, he was already writing and singing novelty songs and also dabbled in acting roles. He was displaying a talent and magnetism that set him apart from others at school. In 1954, after leaving school, he started to work in a Atlanta cotton mill and to spend his free time performing in local Honky-Tonks. The same year, he auditioned for Bill Lowery who helmed a popular live country show over WGST radio. Bill encouraged him to write more songs and booked him for a thirty day tour opening for Ernest Tubb. He will also secure a little job as disc jockey at WGST and started to work with Kenny Lee and the Western Playboys. Another member of that band was steel guitarist wizard Pete Drake. On November 16, 1954, Jimmy Reed performed in Atlanta at a gala honoring Faron Young, just out from the army. Ken Nelson, Capitol's country music chief, was there and Bill Lowery encouraged him to sign Jerry. Ken Nelson told Jerry to wait until his 18th birthday before recording just like he did earlier for Wanda Jackson. The first "Capitol" session was held in Nashville on October 18, 1955 and Nelson recruited Dave Rich, Billy Harlan and Buddy Killen to back Jerry. Billy Harlan remembers well Ken Nelson giving hard time to Buddy Killen on his double bass work. Dave Rich wrote me about Jerry: He was my running buddy. He always had that crazy way about him and was so much fun being around. Back in Atlanta, they had a show on Saturday night (this was before Jerry came to Nashville) and he played guitar on the staff band. I got so close to Jerry that I told him the plan of salvation and he kneeled in my motel room and gave his life to Christ. Jerry came on to Nashville and we were great buddies there. Jerry's first single "If The Good Lord's Willing and The Creek's Don't Raise"/"Here I am" (Capitol 3294) offer solid sides in Tommy Collins and Little Jimmy Dickens style. "I'm Tired Of Playing Cupid" will stay in the vaults and "Just A Romeo", a great side with heavy bass work from Buddy Killen was issued later. Those four songs were his own compositions and showcases a strong vocal and a lot of self confidence. The record sold well around Atlanta where Jerry was appearing on WLW-TV, with Kenny Lee and The Western Playboys, every Saturday night. A second session was arranged on January 18, 1956 still on Nashville and produced his next single "I'm a Lover Not a Fighter"/"Honey Chile" (Capitol 3381) that met just little success. Like earlier one side stayed in the vaults "How Can I Go On This Way" and one "Mister Whiz" was held for future release. "Capitol" promoted him by papers on "Country and Western Jamboree" or "Country Song Roundup" showcasing some very great looking pictures. Standing 6ft tall and weighing 160 lbs, Jerry was really handsome and could have been a real heartthrob. Like for Janis Martin, the challenge was to find how to sold him to the teenage market. Inspired by the exciting new sound, Jerry refitted himself in a rocker for his next session on March 28, 1956. Two sides from his pen cut that day "When I Found You" and "I've Had Enough" are great rockers with steady drums beat and loose vocals. Sharp guitar work and heavy slap bass work made it sound like pre-Burnette Brothers work. I will not be surprised to find here Buddy Harman, Grady Martin, Bob Moore or Floyd Cramer. "Mister Whiz", a fabulous waxing, coupled with "When I Found You" (Capitol 3429) made his better single on the label. His lusty, brash voice belts out those songs in the uninhibited manner of a certain Elvis Presley. On Billboard May 26, 1956, "When I Found You" is reviewed as "A Country Blues with considerable drive and style". Around the same time, Jerry was playing in WLW-TV in Cincinnati (Ohio) and played the Grand Ole Opry backed by Jimmy Dickens Band. In May 1956, he played at the Jimmie Rodgers Memorial Festival in Meridian (Mississippi) with Ernest Tubb, his friend Dave Rich, Bobby Helms and Jimmy Work to name a few. On June 20, 1956 a new session will bring two country songs, one "This Great Big Empty Room" being coupled with an earlier side "Just A Romeo" on Capitol 3504 and the other staying in the basement. The two others songs "You're Braggin' Baby" and "Too Busy Cryin' The Blues" were issued later on Capitol 3592. In spite of the solid backing, they offer nothing special. At the tail end of the session, Ken Nelson asked Jerry to write a song for the new "Capitol" wonder: Gene Vincent. Four days later, Gene Vincent with the Blue Caps cut the great "Crazy Legs" (Capitol 3617). Like Gene Vincent, Jerry takes deep interest in motorcycle racing and powerful cars. On October 25, 1956, four new songs from his pen were cut with fiddle and a new single issued offering "It's High Time"/"Forever" (Capitol 3657). Still offering a solid beat and great vocal work, that single was lost in the rock and roll rave. An unissued song from the session " I Can't Find the Words" offer a lead guitar work real close to Grady Martin's one with the Burnette Brothers. Around the same time, Jerry began to play lead guitar in Ric Cartey's band, The Jiv-A-Tones. In late November 1956, he played with them on a four songs session for "Stars" records owned by Bill Lowery. Three songs were from Jerry's pen and the fourth, "Young Love", from Cartey and Carol Joiner, was the winner. That song was re-issued on RCA 47-6751 in December 1956 but that's Sonny James, on "Capitol", who will turn that ballad on an all-time hit. It's interesting to note than Ric Cartey's B-side "Oooh-Eee", written by Jerry Reed, is a superb rocker that got a far better review in Billboard than "Young Love". Jerry will work from time to time with Ric Cartey in 1957 playing lead guitar for him on two Nashville sessions for RCA. The first session will give birth to "Heart Throb"/"I Wancha To Know", both from Jerry's pen (RCA 47-6828) and another single (RCA 47-6920) will follow with a cover of Don Johnston "Born To Love a Woman". Superb slice of Rockabilly music issued in May 1957. Trying to break Jerry in the "pop" market, Ken Nelson set two new sessions in April 18, 1956 and August 1, 1957. Here Jerry rocked on two novelty songs "Rockin' In Bagdad" (Capitol 3731) and "In My Own Backyard" (Capitol 3823) with vocal chorus and saxophone. "Rockin' in Bagdad" was reviewed in Billboard on June 10,1957 as "A combination of oriental licks and English horn. Provocative entry figures to get a whirl". "In My Own Back Yard", on November 18, 1957, is quoted as "A virtuoso performing by rockabilly Reed, backed by sax and gittars". The last single for 1957 will offer another rockin' tune tiled "Bessie Baby" and a ballad written by Harlan Howard, "Too Young To Be Blue". Both sides were reviewed in Bill on February 10, 1958 as "good for the market". The final session will take place on May 6, 1958 and a last single will offer "Your Money Makes You Purty" and "How Can I Go On This Way" (Capitol 3992). A strange coupling offering a nice rework of his 1956 unissued country weeper with a rockin' song in "White Lightnin'" style. Ken Nelson had probably done his best for Jerry but things had failed. Around mid-1958, Jerry with Joe South recorded, once again, with Ric Cartey for two NRC's sides. Issued on NRC 503 "Scratching On My Screen" is a furious slice of hot Rock'n'Roll and the best song ever cut by Ric Cartey. The following year, Jerry will have himself two singles on that label offering "Just Right"/Stone Eternal" (032) and "Little Lovin' Liza"/Soldier's Joy" (5008). From then, Jerry joined the Army in 1959 and was stationed in Fort McPherson (Georgia) where he was placed in the Circle A Wranglers, the band Faron Young fronted during his own army time in company of Gordon Terry. He married Priscilla "Prissy" Mitchell and, being a family man, they stayed married until now and had two daughters. Funny when we refer to "Mister Whiz" words: All the women fall for me, that's why they call me Mister Whiz. I love them short, I love them tall, I love them fat, I love them all. I work like a minute man. The couple settled in Nashville and, in 1961, Jerry had a record contract with "Columbia". Jerry always stayed close to Bill Lowery who placed his songs with other producers. Jerry's "That's All You Gotta Do," B-side for "I'm Sorry", was a top ten hit for Brenda Lee and "Misery Loves Compagny" was a number one for Porter Wagoner the following year. 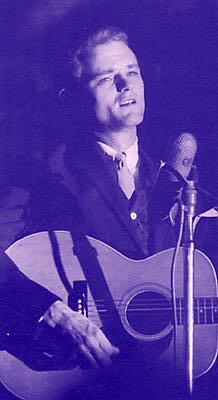 In 1965, Jerry joined "RCA" under the wing of Chet Atkins who released him from his Columbia contract. Chet also used to give to Jerry and Priscilla some studio work with other artists. Priscilla used to write songs by herself and Connie Smith recorded one of them. Chet was determined to patern Jerry as an atypical artist. He wanted to capture his humor and that style that set him apart from others telling him to record like he used to play at Chet's house. Play your licks and sing your songs were his advices to the boy. That strategy will lead, in 1967, to "Woman Shy" and to "Guitar Man" (RC 47-9152) and "Tupelo Mississippi Flash" (RCA 47-9334), two great sides that will chart. "Guitar Man" will find its way in Elvis Presley repertoire (RCA 47-9425) and Jerry was brought in the session to play the guitar part on September 10, 1967. Elvis was unhappy with other attempts so Felton Jarvis bring Jerry in. It was them ever first meeting and they got along great like to typical southern boys. Elvis would also record "US Male" (RCA 47-9465), on January 17, 1968 from Jerry's pen (LSP 3756 �The Unbelievable Guitar and voice of J.R"). That song, for sure, bring inspiration for Hal "The Lumberjack" Willis song "Doggin' In The U.S. Mail" recorded in 2000 with Tommy Allsup, Pete Wade and Buddy Harman. Sadly, Buddy Harman, one of the top 50's drummers, passed away recently. Success will come in the early 70's with "Amos Moses", "When You're Hot, You're Hot" and "Lord, Mr Ford". In 1971, his LP with Chet Atkins titled "Me and Jerry" will earn a Grammy and, next year, it was followed by "Me and Chet". In 1977, he will co-wrote "East Bound and Down" for the movie "Smokey and the Bandit" where he played "The Snowman" role with Burt Reynolds as partner. In the 80's, Jerry was recognized like a guitar maestro like Django Reinhart, Charlie Christian, Merle Travis or Chet Atkins. His playing has the complexity of classical music but the rhythm sense that comes from Country, Rock and Gospel said Thomas Goldsmith. His LP "The Man With The Golden Thumb" (RCA 4315) carries the perfect title. However, Jerry used to tell about himself: What you hear is just me, just what comes into my head. I play harder just naturally because I'm high strung and tense and I guess that's why my picking sound kinda "funky". I'm really a rhythm guitar player more than anything else, I'm not a hot lead guitar player. Of course, I know the neck of a guitar. After all those years, who wouldn't? Some 50's performers had already wrote about Jerry's passing. Here are those words. Jerry Engler: Jerry Reed was one of the most talented persons in show business. He could play a super guitar, had a very good voice, acted so naturally on screen and could write a great song. Jerry was one of my all time favorites. Roc LaRue: I remember when I first saw Jerry Reed on Hee Haw in the 60's. He was very energetic and a genious of a guitar picker. He was always very happy and sort of comedic in nature and was very pleasant and entertaining to watch. I believe his greatest recording was "When You're Hot You're Hot". Another great, talented and unique artist gone - and another artist that will never be replaced. Larry Donn: He was definitely unique. His recording of "Guitar Man" is a classic Jerry Reed performance, and is rock'n'roll, as far as I'm concerned. His guitar playing has always reminded me of Ronnie Prophet. There seems to be some similarity, but I assume it's because they both liked Chet Atkins, and picked up some of his licks here and there. By the way, for those who don't know Ronnie Prophet, he does the best one-man comedy and music show I've ever seen. Fine tributes to a very special Man and a great artist. The complete "Capitol" work done by Jerry Reed is available since 1999 on Bear Family CD "Here I Am" (BCD 16036) and we can't thank enough Richard Weize and Dave Samuelson for them essential work. You can go on that way and enjoy Mister Whiz early work. Another giant has gone.